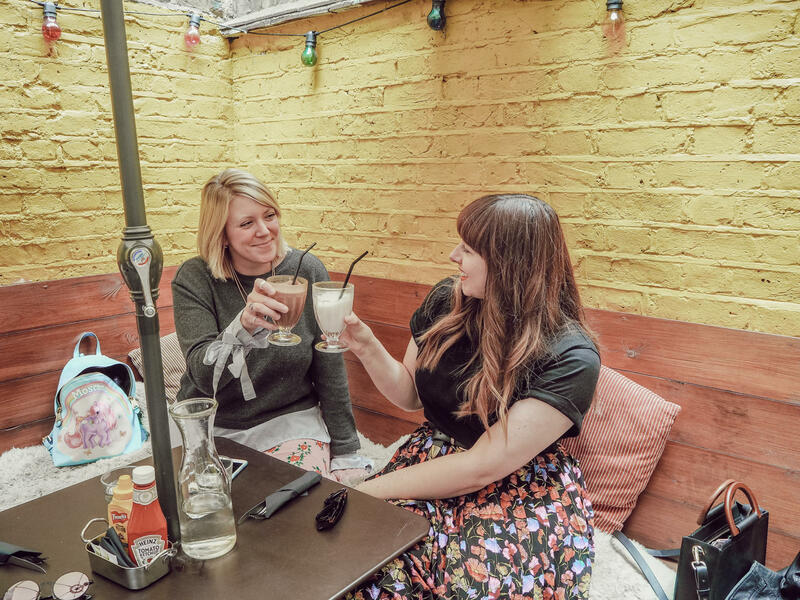 I love meeting up with my girl Amy. 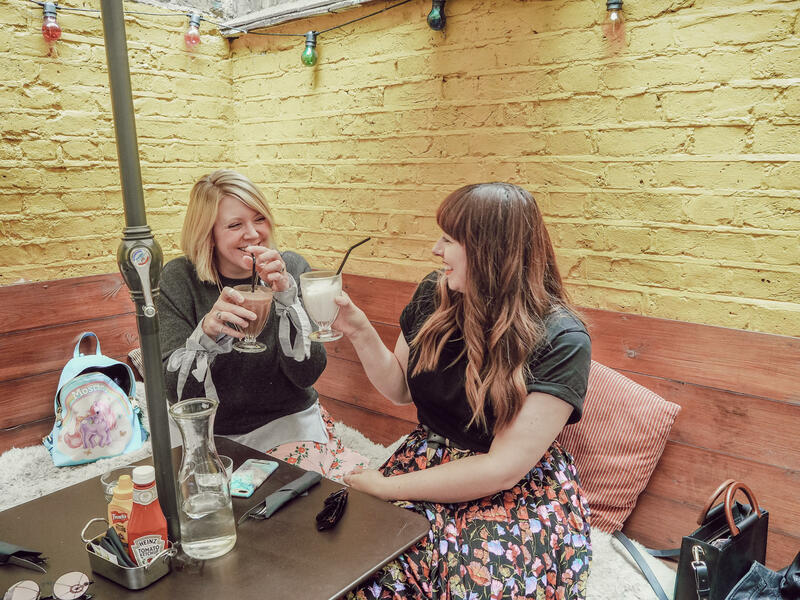 We always have a fab time catching up and it’s always fun thinking about projects we can work on and looking at cute places we can visit. 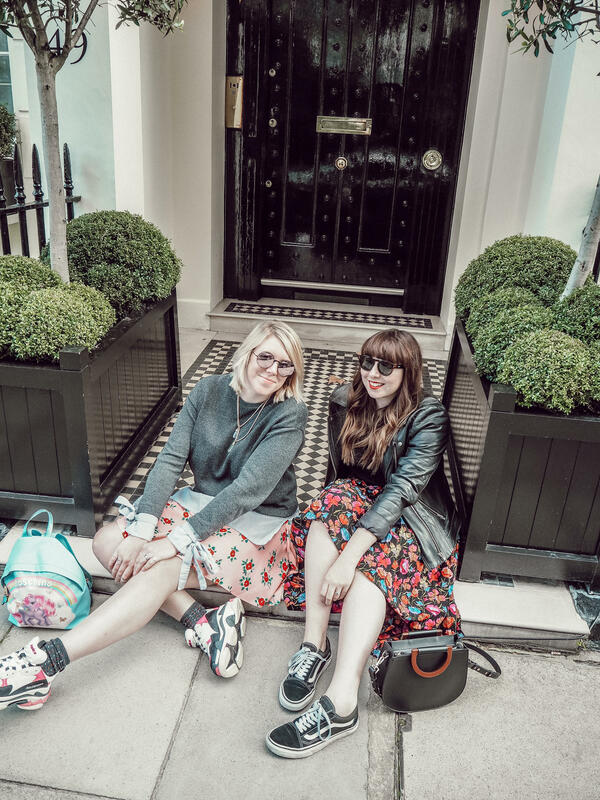 Recently we met up in Belgravia, a part of London we rarely visit together to have a catch-up and some grub. 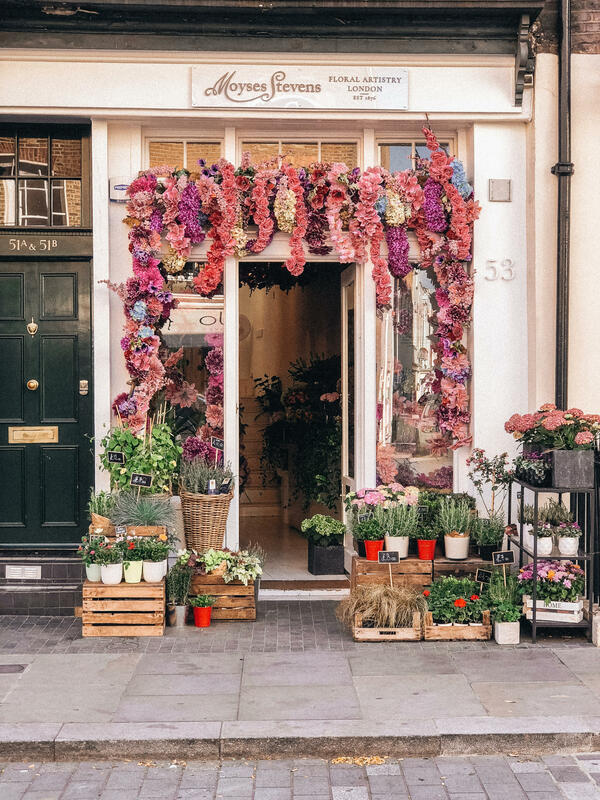 Its a great area of London as there are many cool shops like Donna Ida and Peggy Porschen (which is always busy), and even cute florists and some nice pubs too. 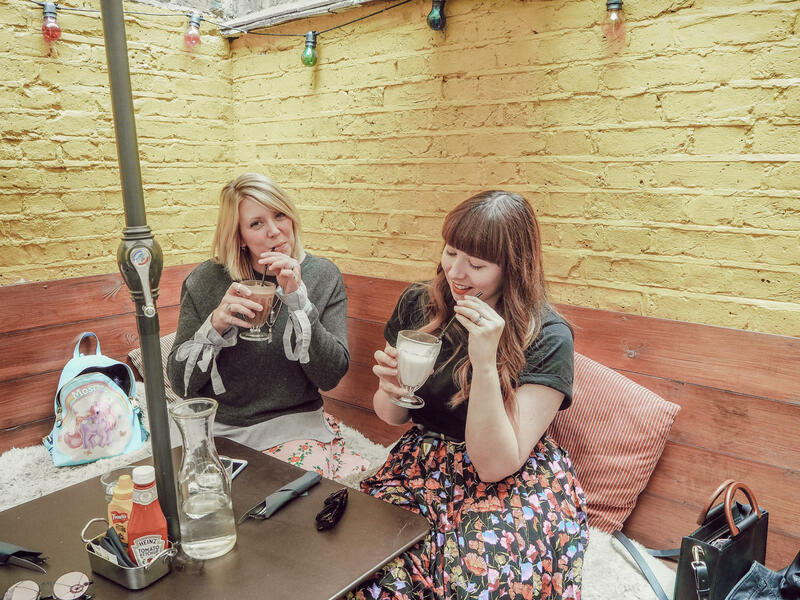 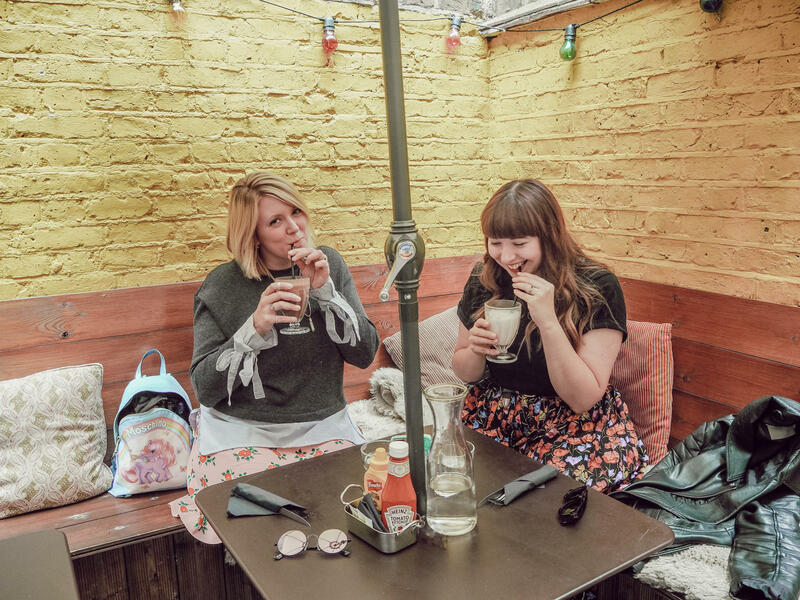 There are plenty of chic places to eat in the area as well and we popped into TomTom Mess hall (about 5 minutes walk from Victoria station) and sat in their courtyard at the back of the store. 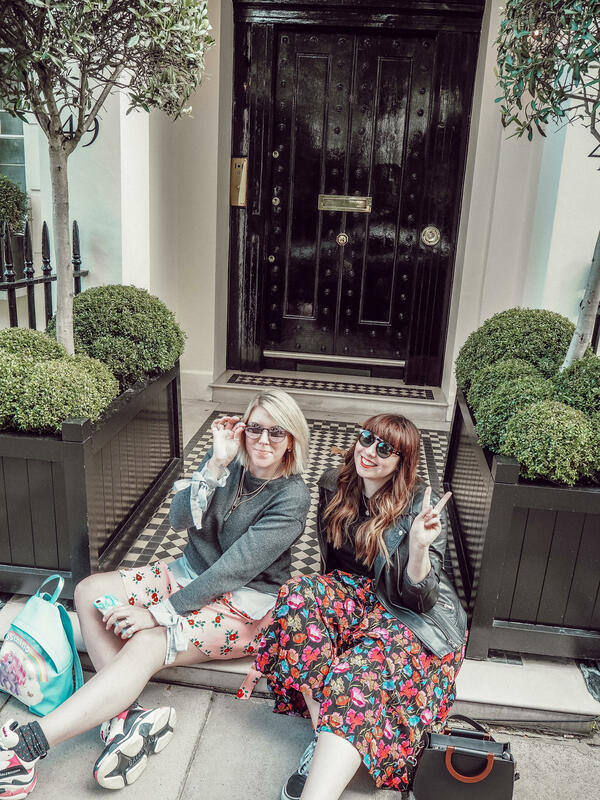 It was beautiful with the sun shining and it was only us there so we had complete privacy which was nice for some chattier and pictures. 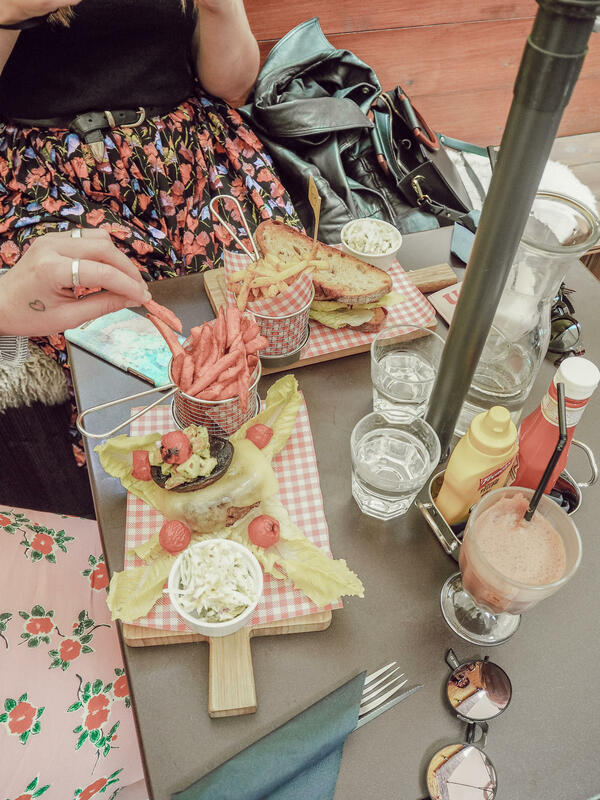 We ordered shakes(as that is all we ever seem to drink together) and some burgers and fries(sweet ones of course!). 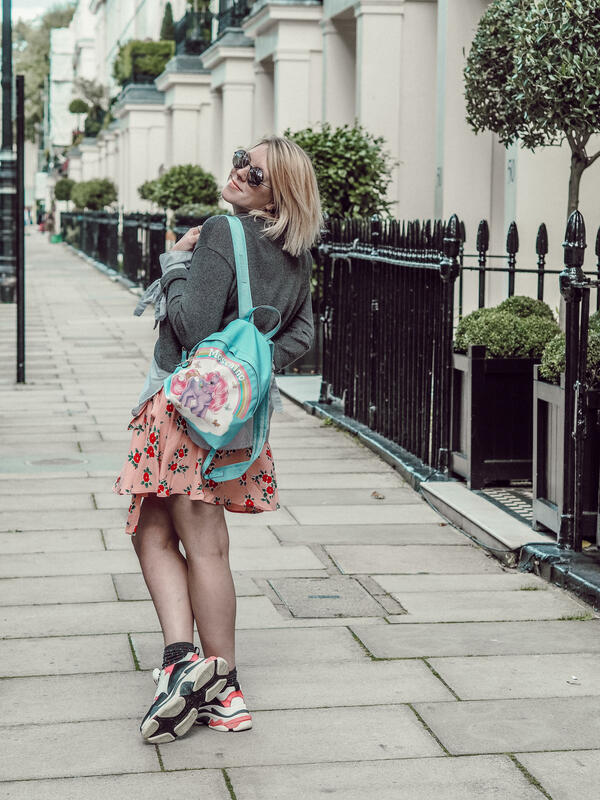 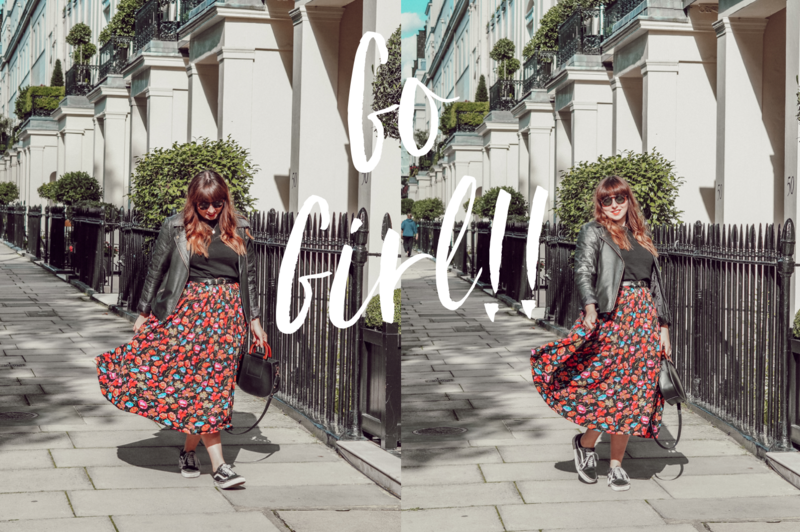 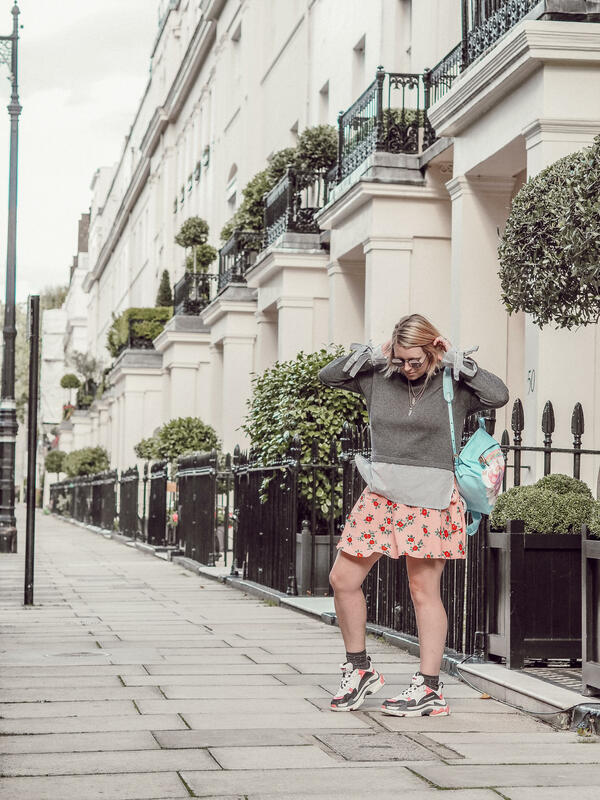 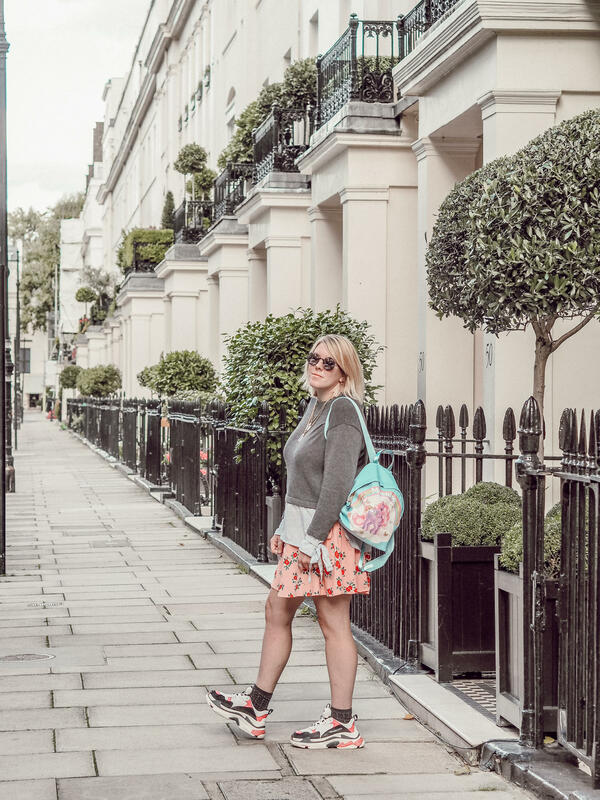 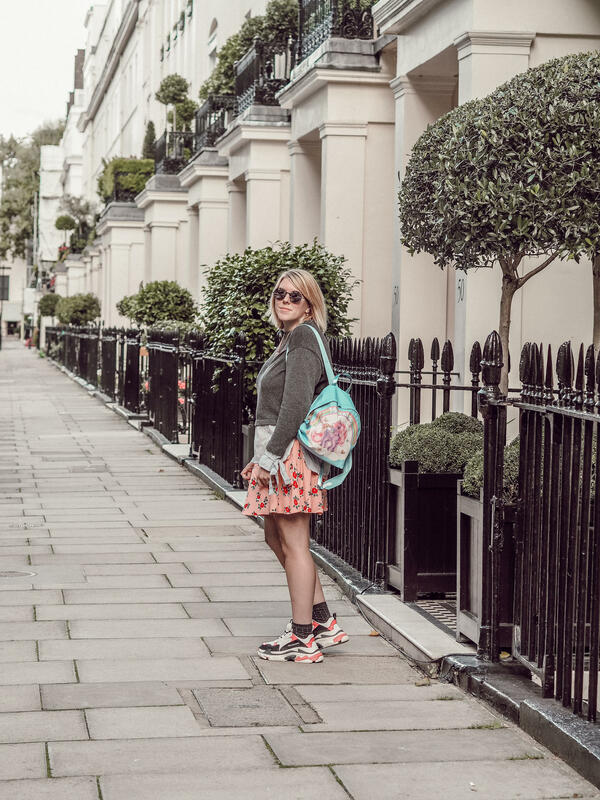 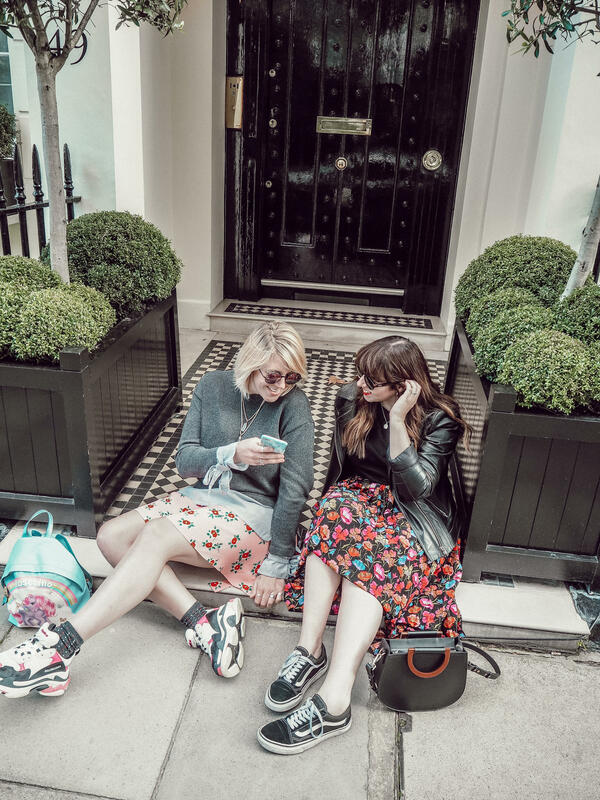 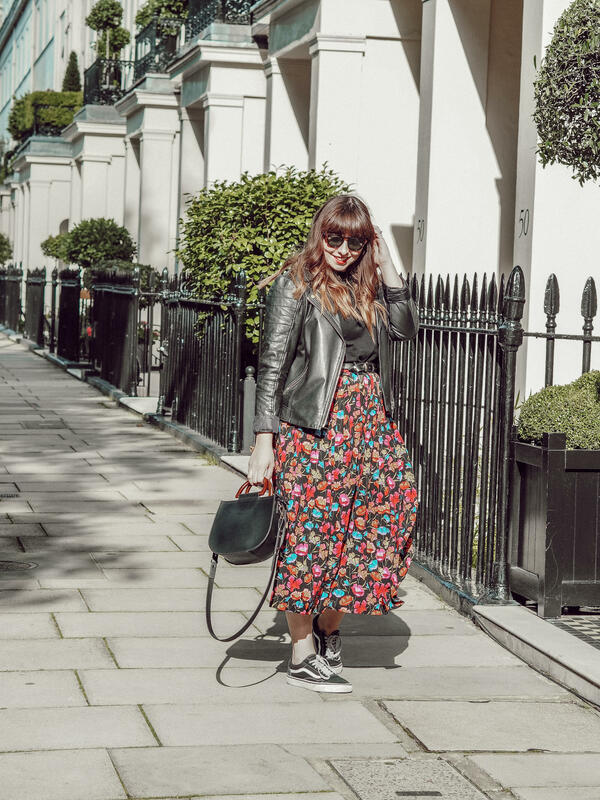 Once we filled our bellies we headed into the streets of Belgravia to capture some outfit pictures. 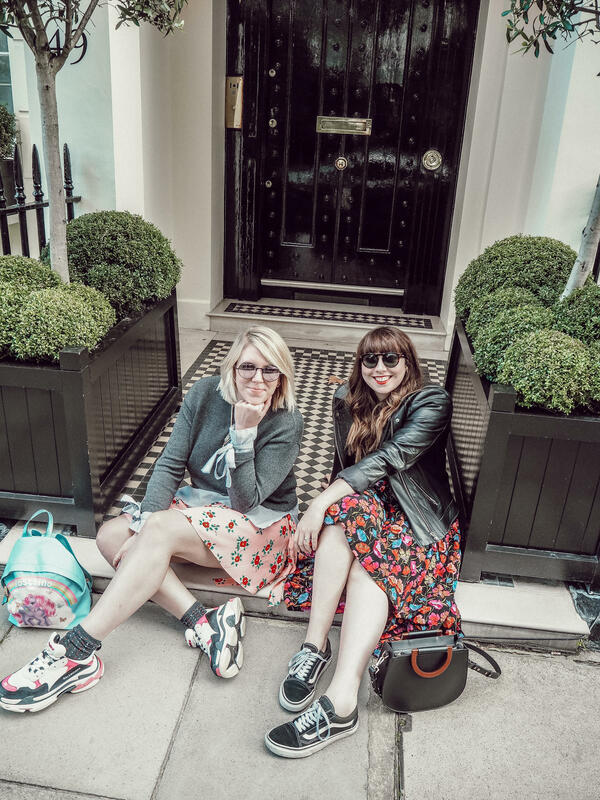 We haven’t met up and done this for ages as life and work always gets in the way so it was cool to take our time and show off some fashion pieces that we are currently mad about! 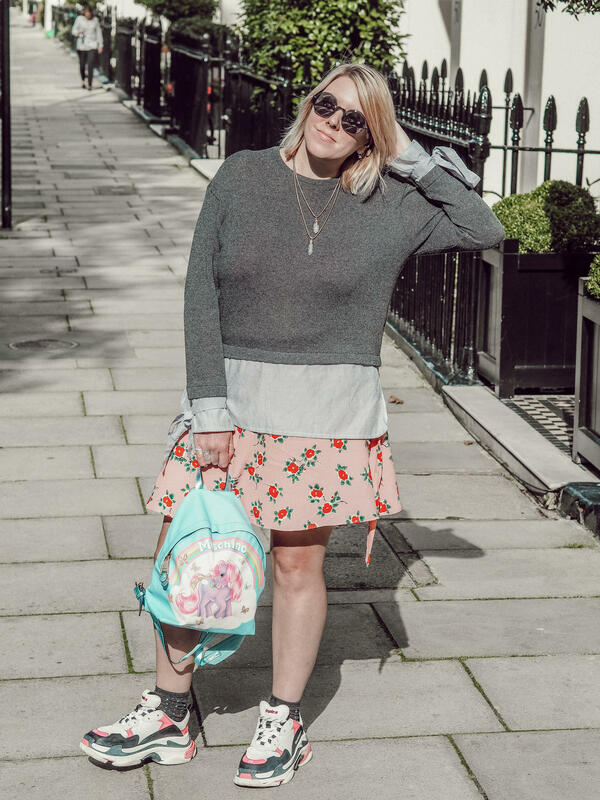 As it’s not cold enough for tons of layers, I thought this cute shirt/jumper from Zara was perfect. 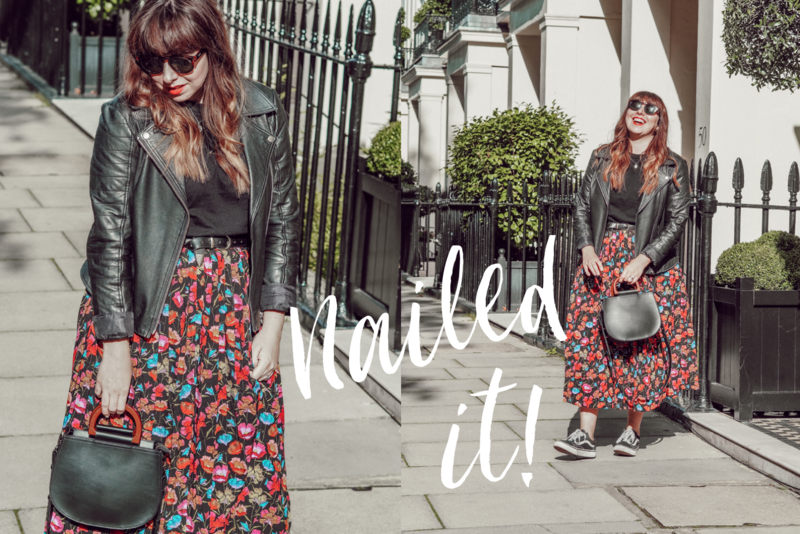 Warm yet cool, it’s ideal for dressing an outfit up or down and I thought it looked so cute with this flippy skirt from Topshop which I nabbed in the sale. 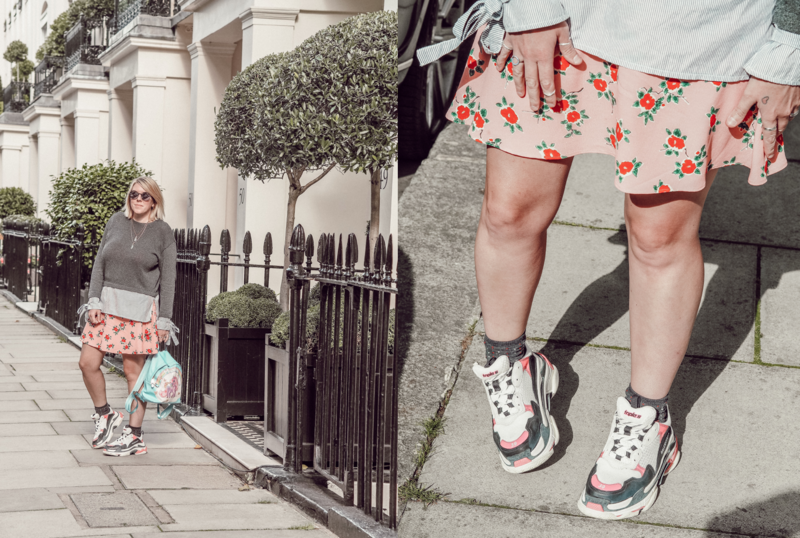 I thought I would also take my Balenciaga’s out for a spin as these Triple S trainers have been such a great investment. 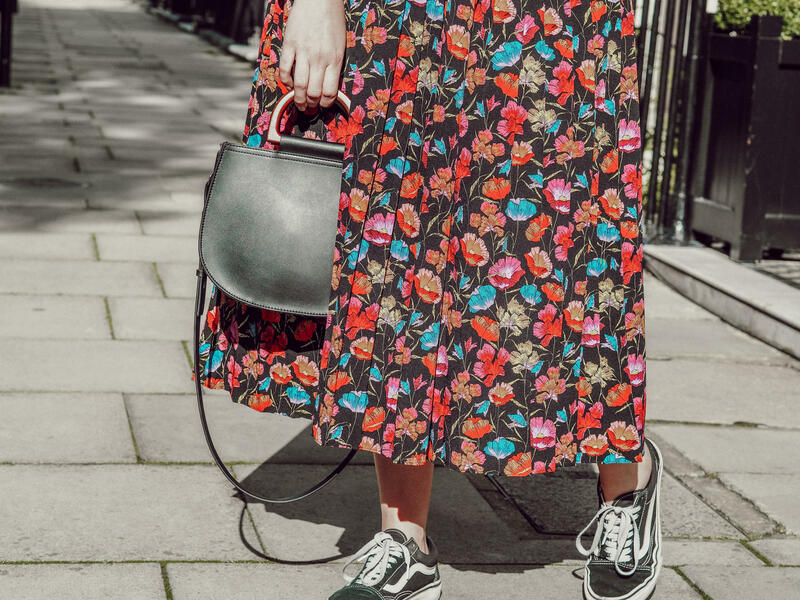 They are perfect to wear with skirts, cropped flare jeans and floaty dresses and even though the price point is a little high, I have worn mine tons already! 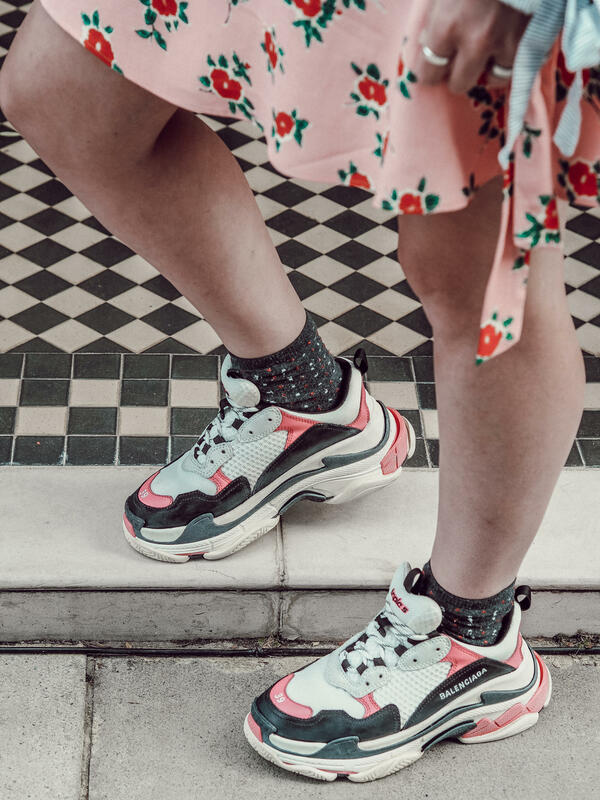 They are so comfortable too which is such a plus when you are spending a bit of cash on an item like these. 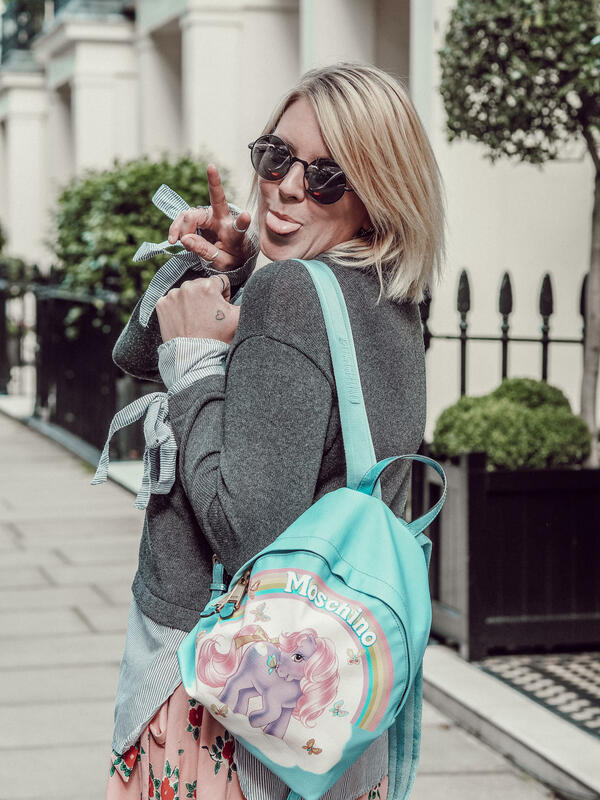 As you probably know by now, I do have a slight obsession with Moschino. 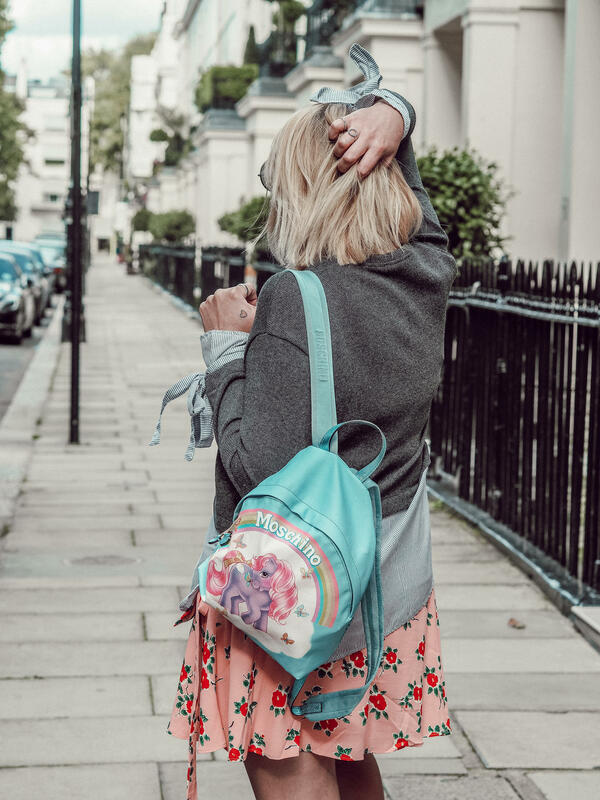 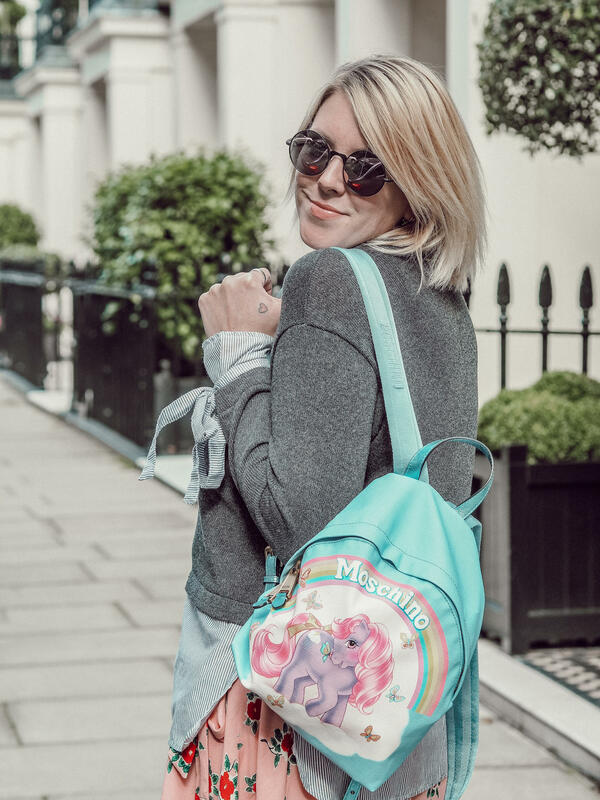 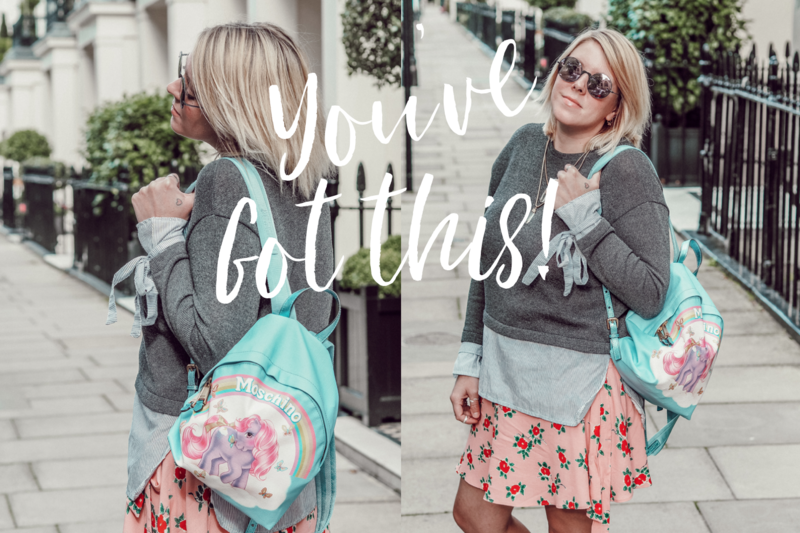 I have quite a big collection now of bags including the McDonalds quilted bag, the Barbie rucksack and x-body bag, the Mario Brothers rucksack and now this uber cute My Little Pony backpack. 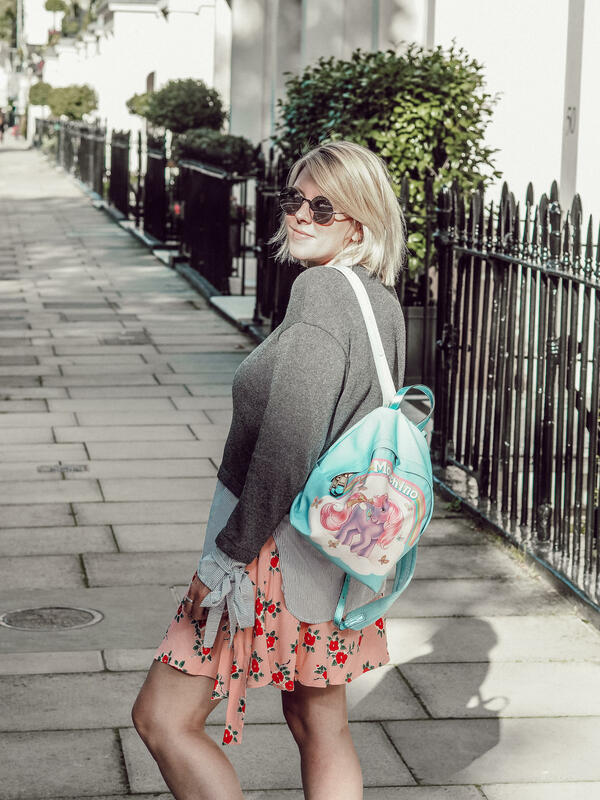 Designed around the original cartoon back in the 80’s (which I used to watch when I was a kid), this bag is a complete revisit back to my childhood and the colours and design are so ME! 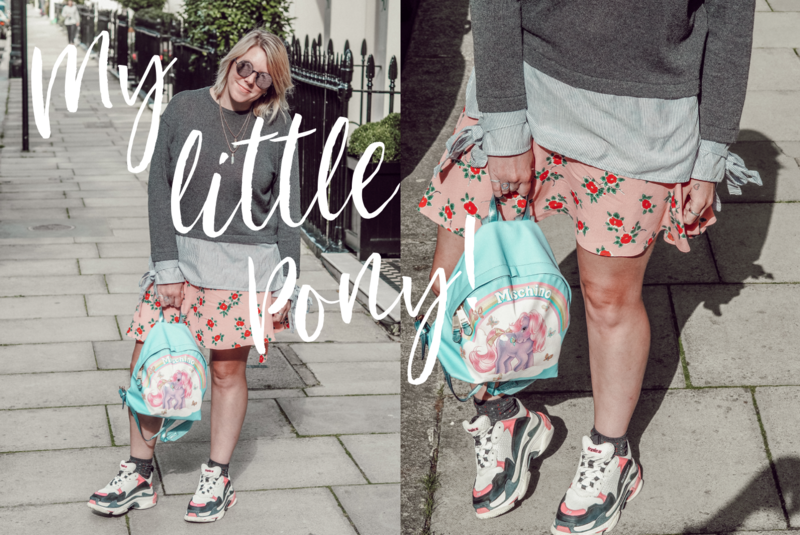 This bag is a great size too and big enough for me to get my everyday items in. 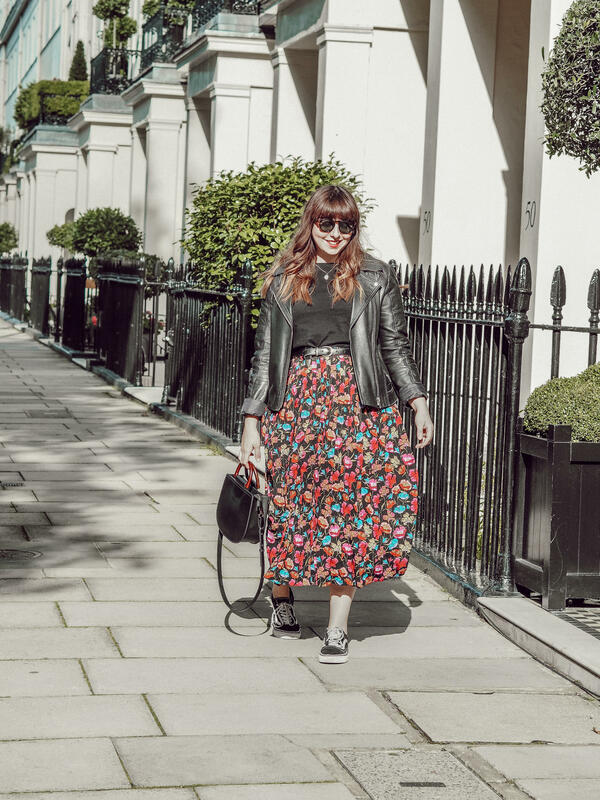 As well as having a lust relationship with Moschino, I also have a big love for Sunglasses. 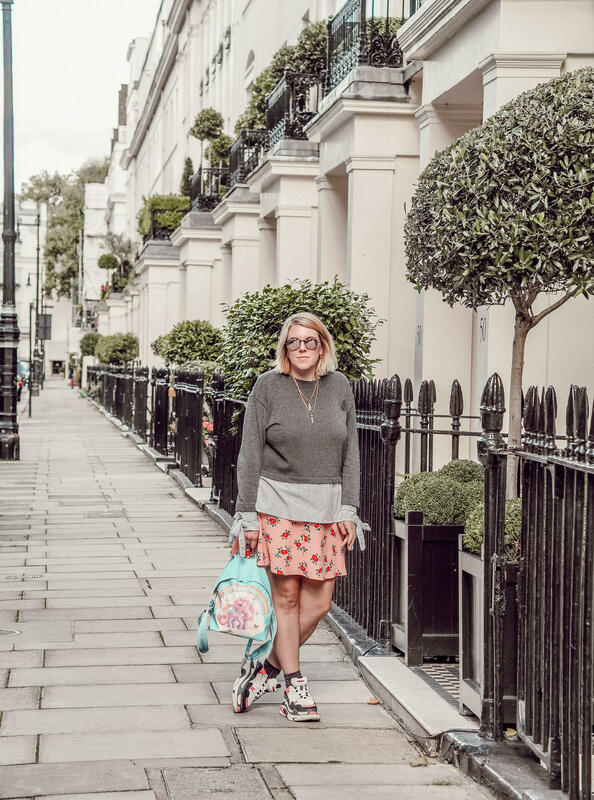 The Sunglasses Shop have some fantastic options and I love these pink round ones from Le Spec at the Sunglasses Shop. 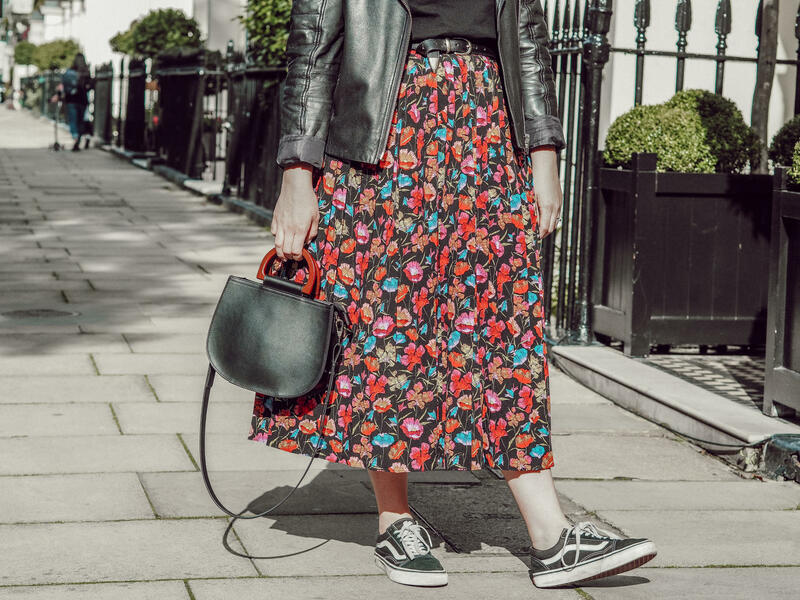 Completely on-trend, they are so comfortable to wear and look really cool with my Moschino bag and this floral skirt. 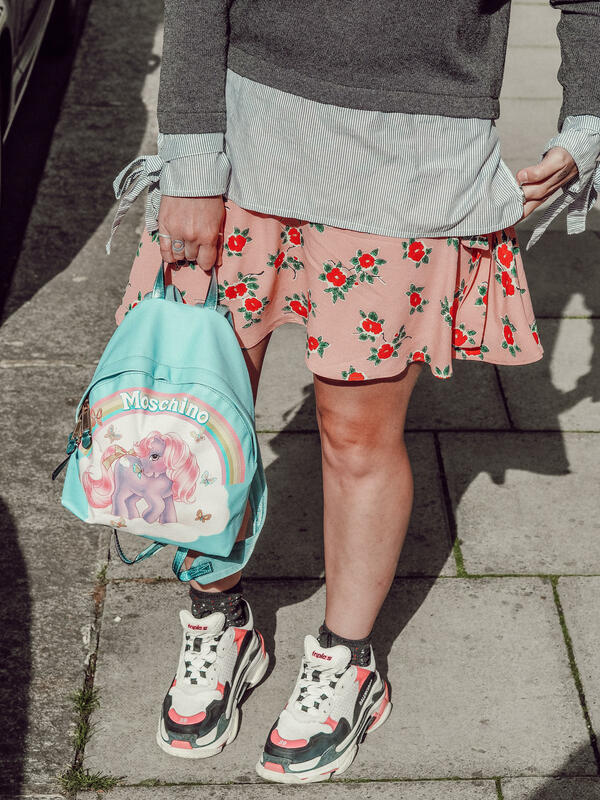 I love what Amy wore on this day. 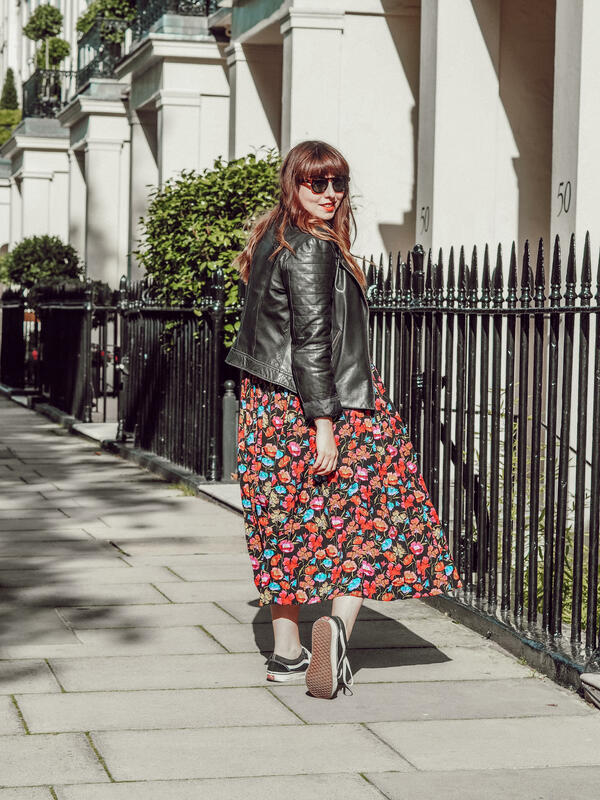 Her skirt from Topshop is so cute and it looks ace with her cool biker jacket and vans. 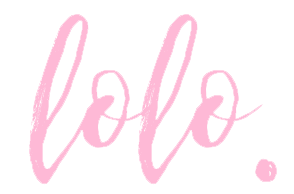 Stay tuned for more from us on our Mimi and Lolo Instagram account!